I have got some awesome news, everybody. Are you ready? Are you excited? King Arthur was on iZombie last night. I haven’t actually watched the episode yet (this is a problem with cutting the cord, but it’s okay, I spent the evening doing very important things like laying on the floor and gently poking Nikki on the nose as she tried to sleep), but I am super excited. Merlin was legitimately a favorite program. I adored Gwen so much, and I am just going to pretend Angel Coulby is on her way to join my new favorite zombie show. Also, if you’re not watching iZombie, you should. I really love Liv Moore and sometimes I pretend she’s a really pale Gail Godwin. Not much else going on except that you can read the first chapter of SUPERVILLAINS ANONYMOUS for free. You know, if you want. …oh, you want more information about that? Really? Well, okay. So a really cool thing happened where C2E2 (where I’ll be next weekend! COME FIND ME) is offering a free ebook to everybody and they’ve partnered up with Nook to make it happen. So right now, all you need is either a Nook, a phone with a Nook app, or a computer to read online, and you can get your own free copy of SUPERHEROES ANONYMOUS. This is the link. 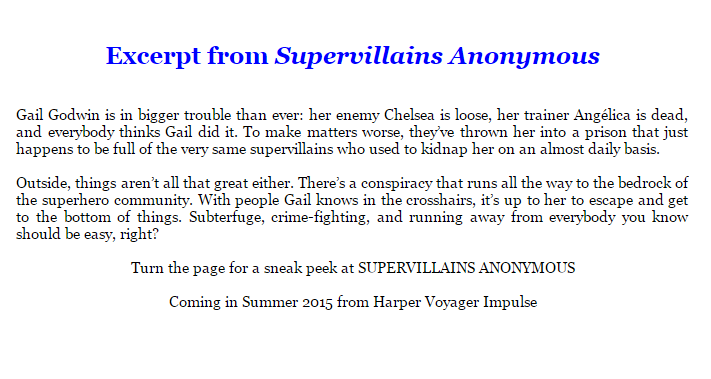 That’s right, they put the first chapter of SUPERVILLAINS ANONYMOUS right there at the end of the first book. For free and everything! But you need to hurry up and grab this offer as soon as you can because I don’t know how long it will be available. The stakes are huge and the hero is short when Hostage Girl returns snarkier than ever in Lexie Dunne’s urban superhero fantasy, Supervillains Anonymous. And don’t worry for those people who can’t get access to the nook promotion. I’ve got you covered. Just come back on Monday. Or sign up for the newsletter over there on the side! Hint hint hint.